Indoor, Outdoor and Completely Portable: Play SNAG Anywhere! 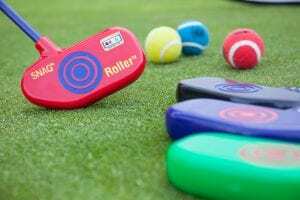 Find out how to add SNAG®’s standards based curriculum to PE programs and introduce your students to the lifetime sport of golf. Designed for safe implementation indoors and outdoors, on grass or gymnasium surfaces, and the ability to teach large groups effectively…SNAG® is ideal for the physical education setting. We have programming to meet a vast variety of programming needs. 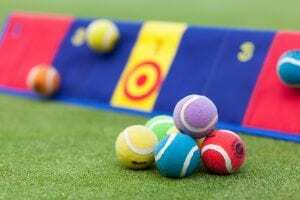 Whether you are running a camp, junior golf program, women’s program, senior’s activities, or a league, we have resources to assist your endeavors! Find out how our learning system can make your lessons fun, and successful, for juniors. Want to expand your program offerings and generate more income? Check out our Active Adults Program for seniors and women. Perhaps one of the best qualities of SNAG® is it’s ability to be played in the backyard. 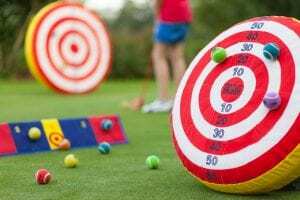 Whether the kids are playing a pick up game or adults are enjoying a friendly barbecue challenge, the modified equipment provides a multitude of games to safely play right at home! 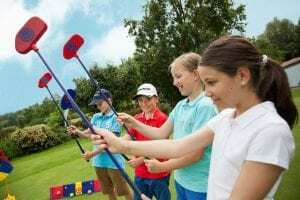 Created for safe play and effective, fast skill development, SNAG® is the perfect resource for teaching professionals to introduce and teach golf to beginners. Not only can it make you more effective as an instructor, but SNAG® enables you to reach large and diverse groups of learners, and even all at one time! If you are interested in becoming more effective teaching large groups as well as being an expert on SNAG®, it’s development, and how to utilize the coaching system effectively across different groups and environments…you definitely want to complete the Level One Certification – Basic Training! Are you a teaching professional? If you are a physical education teacher, a recreation or camp instructor, or a golf professional, register as a SNAG Pro with us. This will give you access to our Preferred Pricing, which provides great discounts on all of our products. The best part…it’s completely free to register as a member!